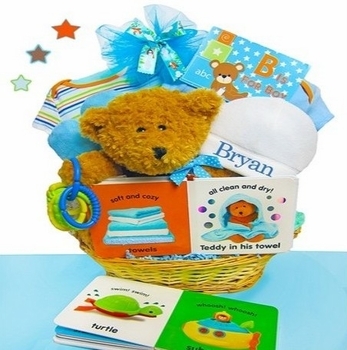 Aptly named…this cute baby basket for boys features an adorable plush teddy bear and more! This gift set also includes two cotton newborn outfits, a teddy bear bath time book and more. The white soft fleece baby cap can be embroidered with baby’s name to create a lasting little keepsake for the precious little boy. Processing Time Personalized: 2-3 business days. Non Personalized: 1-2 business days.